What if all the best hardware can be collected into one device? You think it will cost a fortune. But what if I say there is such a laptop packed with the latest hardware, sporting great design, and costing the third of similar devices available in the market. Well, most of you I am talking about a MacBook or Surface clone. But it’s not the case. Agree, a top brand clone couldn’t feature an Intel i7 processor or 8GB of RAM. Most of the laptop clones look identical to their role model and are packed with horrible hardware. I am not talking about the performance they try to provide. Today we have a great notebook for review, and it comes our way from a well-known Chinese manufacturer, Voyo. We have already taken a peek at some of its laptops such as the Vbook A1 and Vbook V3 Fingerprint. So we know this brand is capable of making perfect laptops. Seems, the Voyo i7 is one of them. Moreover, it’s considered to think this product is the best creation of Voyo. Let’s get deeper and find out why it’s thought so. Actually, the Voyo i7 can be considered as an ultrabook, as it comes with dimensions of 37.50 x 24.50 x 1.80 cm and weighs 1.8kg. Thus all the hardware this body hides inside don’t affect the thickness of the laptop. 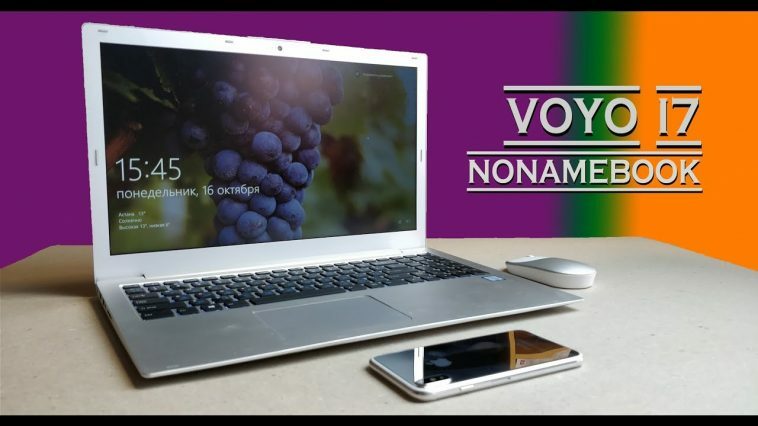 Moreover, the Voyo i7 is portable, which is one of the most required features of any notebook. This product comes with a stylish look. Its housing doesn’t carry anything unnecessary. I mean all lineaments have been thought thoroughly, and as a result, the laptop comes with a minimalist design. It’s made of metal with CNC crafting. So it looks and acts like a top end notebook. However, you may think the metal will make the device overheat. But the company has designed a special smart fan for this product that cools the system not allowing it to get overheated. The Voyo i7 is packed with a 15.6-inch Full HD screen. The display technology is IPS. Generally, there are monitor types – IPS, VA and TN. Plus, the displays have two types of backlights – LED and CCFL. In this sense, the VA panels are better at shades of black. The TN panels provide higher response time, therefore, they have a higher refresh rate. But the best picture is given by IPS. As for backlights, the LED consumes less power and it’s the way cheaper. The CCFL is an older technology. They cost more and consume more energy. So there are four types of displays, nowadays – TN LED, VA CCFL, IPS CCFL, and IPS LED. As you guess, the Voyo i7 comes with the latter. As for the keyboard, it is full-sized including even the numerical part. We used to see Chinese laptops coming with a unordinary arrangement. This is not the case. The Voyo i7’s keyboard has a regular arrangement. Plus, there are a few functional keys added for easier use. The height of the keys is the best level, and the keystrokes are acceptable as well. The keys material is plastic. But I have a feeling it’s a high-quality plastic unlike many other laptops available in the market. So, the typing is not a problem even if you spend hours in front of this laptop. The keyboard is backlit. There are several LED lights located on the upper right side, above the keyboard. They indicate different cases such as ‘on battery’, ‘charging’, ‘Caps Lock On’, etc. The power button is placed on the very upper right corner. We used to see this button on the left side. But you won’t confuse it with anything else due to a circle shape and metal. Finally, the touchpad is below the keyboard slightly moved to the left. This is what we require from the manufacturers. The Voyo i7 comes with an impressive set of interfaces. Two USB 3.0 ports, a full-size HDMI port, and a USB Type-C port are located on the right side. Another USB Type-C port, a USB 3.0 port, an SD card slot and DC hole are on the left. There are no holes, interfaces or anything else on this device but a 0.3 camera located above the screen. Though the design of the Voyo i7 can be considered as one of the selling points, the hardware it comes with is just astonishing. This laptop is powered by the Intel i7 processor, as the name suggests. The Intel Core i7-6500U is an ultra-low voltage dual-core chip based on a popular Skylake architecture. Though it’s been launched back in 2015, it still can be found on top-notch notebooks. Regularly it is clocked at 2.5GHz, but this SoC can reach up to 3.1GHz frequency when boosted. There is also an HD Graphics 520 GPU and dual-channel channel DDR4-2133/DDR3L-1600 memory controller. But the Voyo i7 comes with a NVIDIA GeForce 940MX graphics card, 8GB of DDR3L RAM, and 1TB HDD that can be expanded via SSD card slot. The chip uses 14nm process with FinFET transistors. As I said, the Intel Core-i7 6500U SoC is based on Skylake architecture that’s come to replace both Haswell and Broadwell. The main improvements made in this architecture refer to the increased out-of-order buffers, optimized prefetching, branch prediction, and additional performance gains via Hyper-Threading. Shortly, this chip provides performance identical to the Core i5-4300M (Haswell, 37 W) or the Core i7-5600U (Broadwell, 15 W). This chip scores 4350 at PassMark CPU benchmark that is a good result. The i7-6500U uses less battery power and runs cooler than the quad-core counterparts. It consumes only 15W like many i3 and i5 chips, while many i7 SoCs consume 45W. Therefore, this dual-core chip is just great for thin notebooks like the Voyo i7. As for the graphics card, it’s a mid-range card with a DirectX12 support (FL 11_0). It was announced later than the chip the Voyo i7 comes with. Actually, this is the updated variant of the GeForce 940M, but it supports faster GDDR5, though this one comes with a 2GB DDR3. So we can say the NVIDIA GeForce 940MX is identical to the Maxwell GPU in the Microsoft Surface Book but with more memory and higher clock speeds. It scores 1880 points at 3D Mark. At last, the Voyo i7 comes with a 12000mAh capacity battery and a 48.8W charger. Thus, the laptop can work for 5-6 hours on a single charge. But you have to know it requires almost the same time to charge fully. The Voyo i7 is not the best laptop on the market. If the manufacturer uses Intel Core i7-6820HK with a score of 9050 points, ATI Radeon HD 5850 with a score of 2250, 5MP front camera, and a battery supporting fast charging technology, it would be great. And we can talk about the most powerful notebook around the globe. But the aforementioned features can be found only on the toppest-end laptops at a price tag of several thousand dollars. So, we have what we have. But you don’t have to think the Voyo i7 is a mid-range laptop. No way. It’s a high-end notebook capable doing any task you give. Thus, you can acquire a great laptop for the third of the price top brands come in. DOOGEE S60 Not Only Good For Outdoor Working, But Also Good For Outdoor Shooting.